Murania Press » Now THAT’S a Review! Don’t believe any author who claims not to pay attention to reviews. He might discount the good ones and ignore the bad ones, but believe me, he pays attention. I’ve been extremely fortunate to receive uniformly favorable notices for my books, most recently the award-nominated Distressed Damsels and Masked Marauders, and previously Filming the West of Zane Grey and The Films of Betty Grable. But the reviews for The Blood ‘n’ Thunder Guide to Pulp Fiction have been uncommonly laudatory, particularly on Amazon, where the book has received nothing but five-star ratings. Although online searches and stumbling through websites can unearth a wealth of information on many subjects, I like to reward individuals who go through the extra effort of writing, laying out, and printing a book on whichever subject I’m interested in researching. I’ve purchased guides on progressive rock albums, television horror movies from the seventies, direct-to-video cult films, Western television shows of the Fifties and Sixties, American martial arts films, country music, anime, heavy metal, soul music, and other niche subjects. 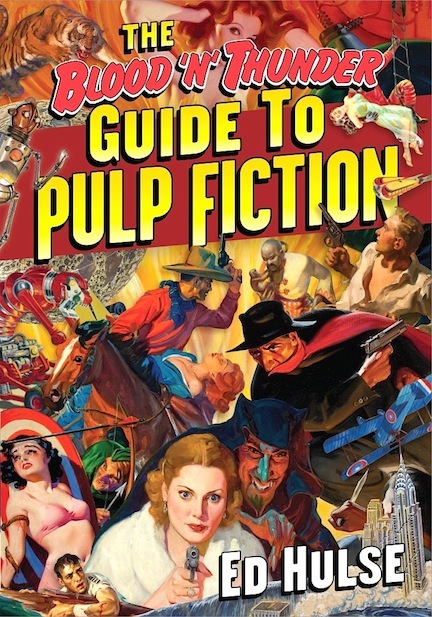 Not until I read The Blood ‘n’ Thunder Guide to Pulp Fiction had I read a guide that intelligently and tastefully delivered the promise of its premise. As a longtime fan of H.P. Lovecraft, Clark Ashton Smith, R.E. Howard, Max Brand, Edgar Rice Burroughs, Isaac Asimov, and David Goodis, I had hoped that a guide on pulp magazines would reveal to me some lesser known, but comparably skilled authors from the pulp milieu. This information lies in great abundance in Ed Hulse’s book. Although I have not read this tome cover to cover, I have read the major part of the book, and many of the chapters multiple times. The wit and good taste that the author shows when discussing the subject of pulp fiction led to my discovery of scores of forgotten works that deserve rediscovery. This valuable guide is neither the slobbering work of rabid fan who likes everything, nor the work of a snobby elitist who feels superior to the material about which he writes, but a collection of smart, zesty essays—arranged by genre—of somebody who appreciates the varied aims of various pulp magazines. The rich and meticulously crafted tales of the stately Adventure, the apocalyptic visions of Operator #5, the hyperventilating bloody mania of The Spider, the aggressive modes of detection employed by those fellas in Dime Detective, the depravity of the Red Circle shudder pulps, the grandeur of Astounding Stories, the eldritch charms of Weird Tales, and the merits of many other genres and subgenres are critically and fondly discussed by the wellspring of pulp knowledge that is Ed Hulse. Wanna know which pulps to read as the best of their genre? Follow the advice of Mr. Hulse. Wanna know which exact issues of each magazine are the exemplars? Follow the advice of Mr. Hulse. Wanna know about the evolution of a particular magazine or genre? Get this book. Heeding the thoughtful words of this sage of the yellow page, my library and life have been bettered and my list of favorite authors has dramatically been altered. Thank you, Mr. Hulse for opening the pulpwood door behind which stand such incredible talents as Norvell W. Page, Bruno Fischer, Arthur O. Friel, L. Patrick Greene, Harold Lamb, Frederick C. Davis, D.L. Champion, and many others. Now that’s what I call a review! Full disclosure: I’ve met Craig Zahler, who has now attended several meetings of the Gotham Pulp Collectors Club and conveyed to me in person his appreciation for the Guide. But no, I didn’t pay him to write this glowing review (just in case some of you wise guys were about to ask), and didn’t know he had written it until I saw it on line. If you consider yourself a serious fan of vintage pulp fiction, there’s still time for you to take Mr. Zahler’s advice and “Get this book.” How, you ask? It’s a cinch: just click here. Better yet, you can get the Guide along with a one-year subscription to Blood ‘n’ Thunder, with a 25-percent discount for both, here. Wow! Now that makes it all worth while doesn’t it? Proud of you Ed but you certainly deserve those high accolades. I was one of the people convinced to buy this book by the unanimous five star reviews onAmazon. And after I read it I agreed with every one of those reviews. Altho I’m sorry I didn’t buy it from you here because I know the writers don’t get as much profit from Amazon sale. But I didn’t know how this site when I searched “pulp fiction” on Amazon.